If there's one thing I truly love about camp it's that it often celebrates a culture which is otherwise marginalized by mainstream society. I am often happily surprised by new sub-cultures I had never even thought of. 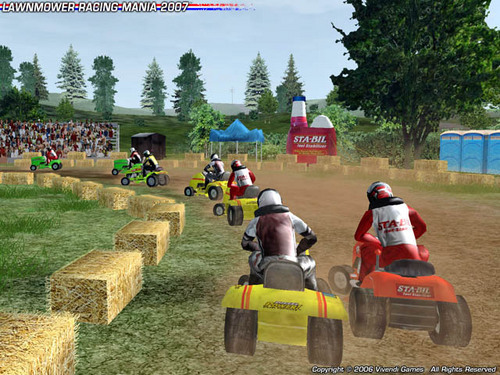 Case example: Lawn Mower Racing. Who knew that there was an official league for people who race lawn mowers? I made this discovery in a very roundabout way. I was on a tour of my usual Consumer Guide when, at Big Lots, I found a copy of a Lawn Mower Racing video game. Now, I'm a bad move man myself, but the thought of a video game about racing lawn mowers was just too intriguing. The game itself, for all you might care, actually plays pretty well, but the real gem is a 10 minute interview with two "professional" lawn mower racing icons. The first is Bruce Kaufman the president of the US Lawn Mower Racing Association and the other is an actual racer, Bobby Cleveland- one of the best in the country. The interview is titled "Seedin' the Turf: A mowtivational interview with Bobby Cleveland and Bruce Kaufman on the finer points of the sport." Did you catch the pun in there? Well don't worry, you'll have plenty more time to practice spotting "mow" puns shortly. Bruce explains that lawn mower racing began in England and quickly became popular because of its relative cheapness. Racing began in the 1960s in the US and eventually gained enough popularity to warrant a formal league and it's now been "Rocking and mowing ever since." Bobby tells us about his racing strategy. Every race begins from a non-start. Each racer must run across the track and start his or her mower after the race begins. For Bobby, the key to victory is getting a good start on your mower. Top speed isn't necessarily the best way to go, especially if your mower has a slow start. Bruce refers us to the website [letsmow.com] for information on how to get started in lawn mower racing. Further, there are 20 local LMRA (lawn mower racing association) chapters in the US. They are all east of the Mississippi with the peculiar exception of Arizona. Because Arizona is certainly known for extensive… grass??? I leave it to you to say "The hell?" I wouldn't have started racing without my ex… well, at the time, my fat brother in law. Uh, he married my skinny sister. We became good buddies. He's a mechanic so he fit right in with the lawn mower racing. So… we spent a lot of time together in his basement building lawnmowers… She [the skinny sister] would cook a big dinner than back downstairs working on the mower. And we thought everything was great cuz we was at home down in the basement and she'd come down and visit with us and she like lawnmowers too… so we did that for years. One season we were out on the road ever other week. So we did that and had good times and spent a lot of time together. Well… my sister and my fat brother in law finally decided they was gonna seperate so they did and ended up divorcing and at tht etime I thought it was one of those things… but my sister let me know he [the fat brother in law] was spending too much time with me instead of her. 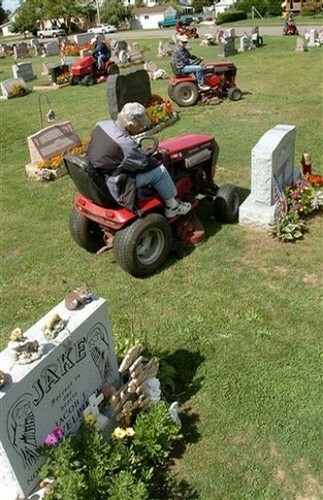 So because of that lawnmower racing can be good and lawnmower racing can be bad. In this case it was good and bad. We go on to learn that there's no monetary reward for lawn mower racing, it's really just a social thing to do (from Bobby's perspective). Most of the guys get wives or girlfriends to cut the grass because we're too busy tearing it up! Most of the women who come to the tracks are pretty… country. And the woman you can pick up at a lawn mower race doesn't belong at a lawn mower race. Bruce informs us that a big part of lawn mower racing is about having a sense of humor. This often gets expresseed in the racing names competitors choose for themselves, such as: Turfinator, Sodzilla, Mowdacious, Sir Lawns-a-lot. Hedgehog, and The Lawn Ranger. In short, Bruce adds, "We invent ourselves as we mow along…"
We wrap things up with Bruce proudly displaying a bumper sticker that reads, "Everyone is somebody in lawnmower racing." The following USLMRA racers were near and dear to us, and remain forever in our hearts. The grass may be greener on the other side…but it still must be mowed.